Take Loop 1 North to Northland Dr./FM2222 exit, turn left on Northland Dr. and go .8 miles, then turn right on FM2222. Take FM2222 about 9 miles to FM620. Proceed straight across FM620 where FM2222 will turn into Bullick Hollow. Continue on Bullick Hollow 5 miles until it dead ends into FM2769. Turn left on FM 2769, continue 4 miles to the flashing light at Lime Creek Rd. Turn right on Lime Creek Road at the flashing light. Take the first left onto Dodd Street. Aquaholics Watercraft Rental / Dodd Street Marina is on the left. 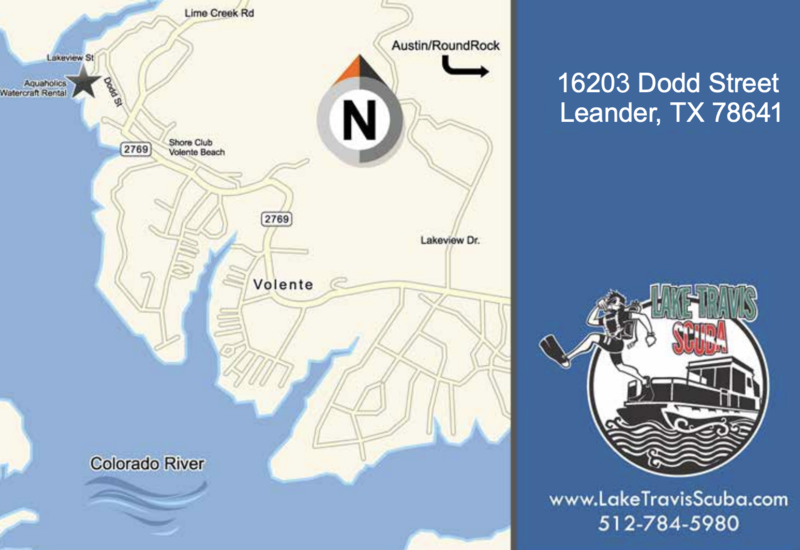 Turn into Aquaholics Watercraft Rental and follow the gravel driveway to the parking area near the shore and docks. Take 620 west to Anderson Mill/Volente West. Turn right on Anderson Mill Road/Volente west. Turn left at the first stop light, which is FM 2769/Volente Road. Continue 7 miles to the flashing light at Lime Creek Rd. Turn right on Lime Creek Road at the flashing light. Take the first left onto Dodd Street. Aquaholics Watercraft Rental/Dodd Street Marina is on the left. Turn into Aquaholics Watercraft Rental and follow the gravel driveway to the parking area near the shore and docks. Arrive no later than 30 minutes prior to your departure to prepare loading your equipment. Provide your PADI Boat Travel and Scuba Diving Liability Release and Assumption of Risk Agreement and PADI Standard Safe Diving Practices Statement of Understanding to the boat operator. These forms are required before boarding Giant Stride. Call 512-784-5980 to notify the boat operator if you will be running late.